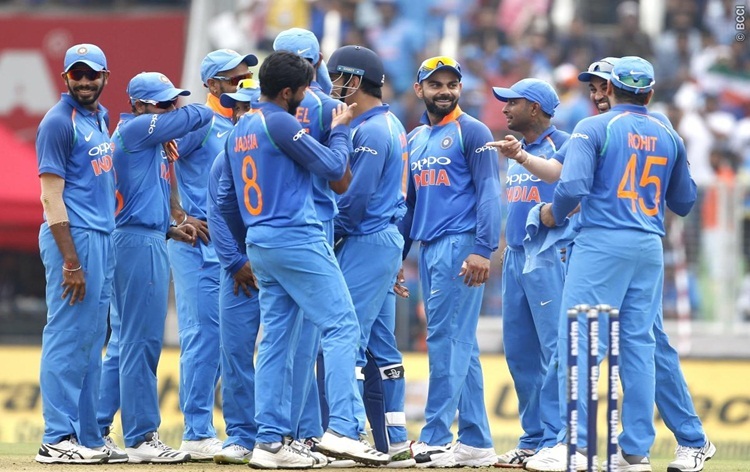 India clinched the five-match series 3-1 defeating the West Indies by 9 wickets in the fifth and final One Day International at Thiruvananthapuram on Thursday. Riding on Rohit Sharma's 63 off 56 balls, India achieved the 105-run victory target in 14.5 overs. Skipper Virat Kohli contributed 33. India lost a lone wicket of Shikhar Dhawan, who scored 6 runs. Rohit continued his fine form in the process going past the 1,000-run mark for the current calendar year and also hitting his 200th six in ODIs. Ravindra Jadeja was adjudged Man of the Match for his four-wicket haul. The Men in Blue had won the first ODI by 8 wickets before the second match ended in a thrilling tie. The Windies had clinched the third game by 43 runs. Team India again took the lead with a 224-run victory in the fourth one-dayer. Indian skipper Virat Kohli was adjudged Man of the series. This is also India's sixth successive series win at home. India had lost a series at home in 2015, when they went down 2-3 against South Africa. Now, both countries will play three Twenty-20 matches.